A unique multi-disciplinary meeting ground and experimental space, Pages features quaint, quiet, and spacious accommodation that includes well-appointed guest rooms and apartments, office spaces, and a design area. 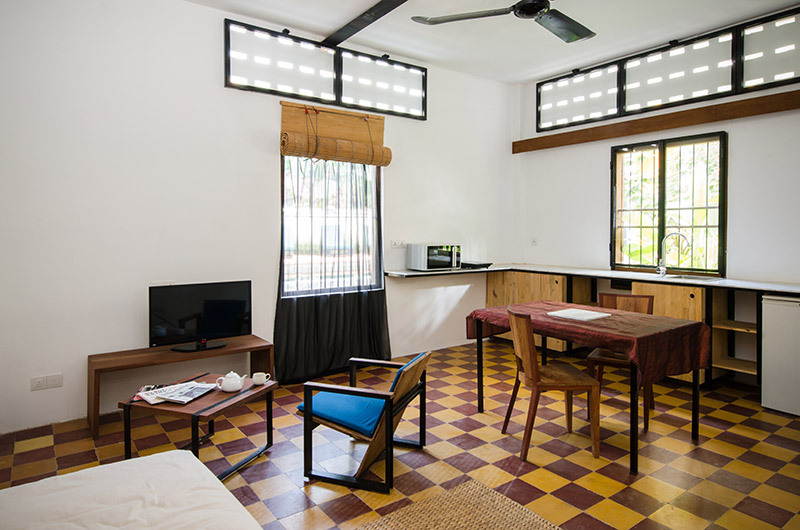 Set in a building from the revival-era of Cambodian art and architecture, circa the mid-1960s – it has been deliberately kept authentic in feel, with only necessary mod-cons added; there is also a second modern design building, set back from the pool and tropical garden, where the guest rooms are located. Pages Rooms & Café is a multi-purpose space and a relaxing retreat from the vibrant surrounding town. 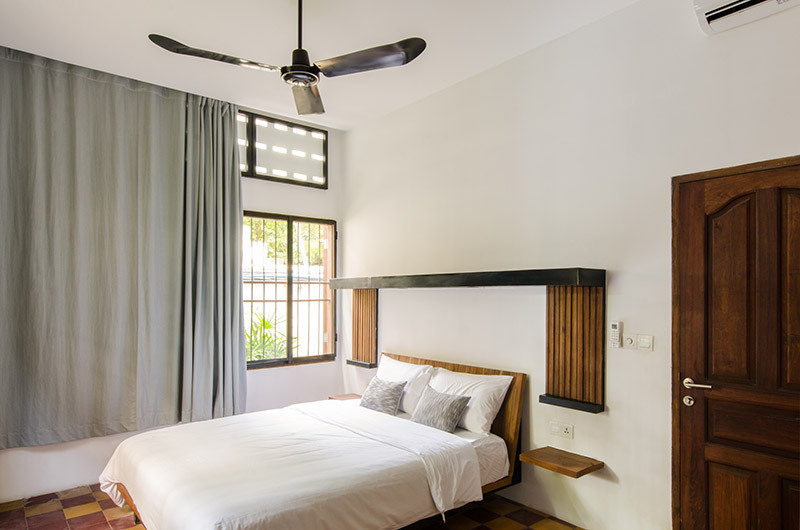 Excellent place to stay in Siem Reap. One can’t ask for more. 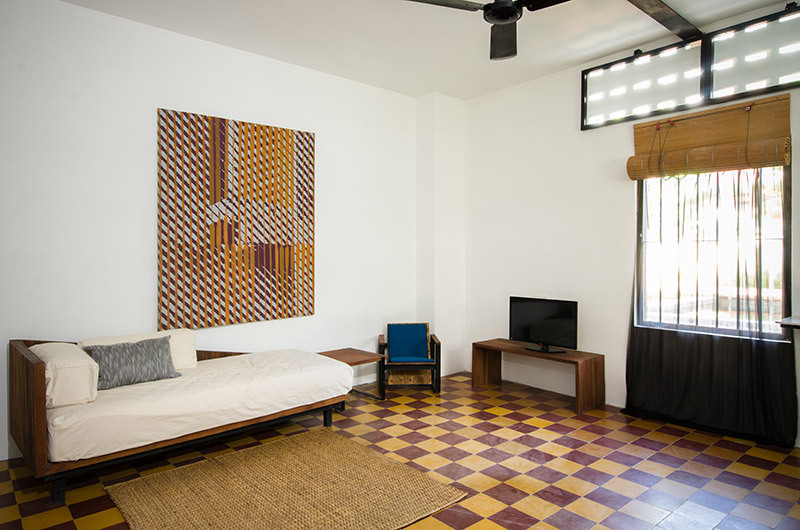 Perfect location – 10 minute walk from the night market and the Pub Street, tucked in on a quiet street. The service is impeccable, super-friendly and helpful. Food and drinks are freshly made (fresh fruit squeezed for drinks), very reasonably priced, and delicious. There is laundry service available, airport pick up, arranging tuk-tuks for Angkor Wat or any other tours. The entire place: rooms, public areas, and the pool have a great style – really good design. 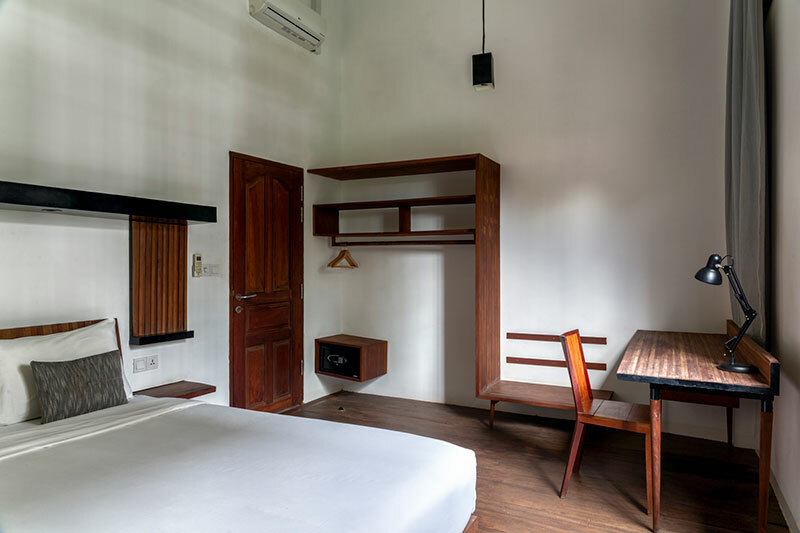 On top of it all, this is an environmentally conscious place – a nice change from all of the other hotels/hostels/guesthouses we stayed in on our 8 week trip through SE Asia. I would highly recommend this place! After a ten hour bus journey arriving here was the perfect antidote. The shower was incredible and literally made everything better. Room has nice finishing touches including free filtered water, Bodia spa products and NO PLASTIC BOTTLES! Try the veggie spring rolls and chocolate pot from the restaurant – they were very tasty. Pool is small, but gets sun all day and is perfect for cooling off. I’d definitely stay here again and would recommend you to too! First of all, thank you Pages team to make my stay wonderful. I feel like home. The design is outstanding and practical. The room I stayed was spacious and safe. Breakfast was amazing. Everyone was very friendly and caring and also Jimmy who made everyone smile. 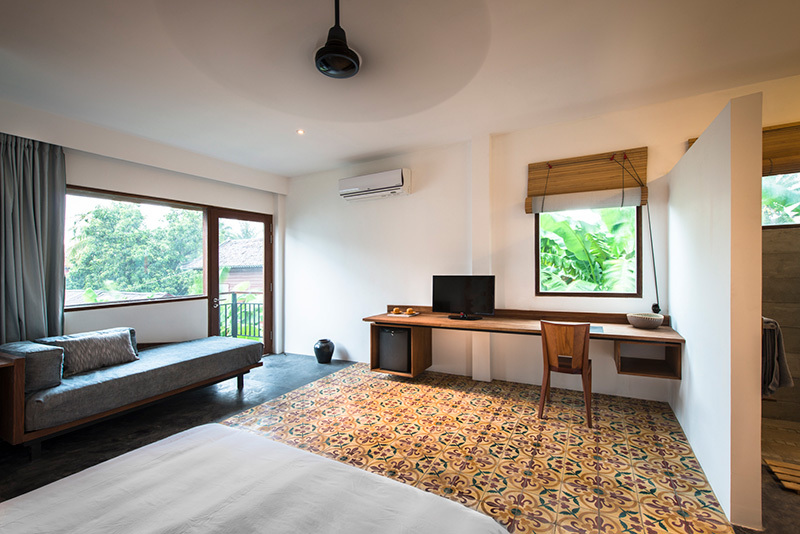 I’d definitely go back again and recommend Pages Rooms to my friends and family. Thank you once again. Arrived to a refreshing cold towel and delicious mint and lime welcome drink. Quick check in and could access my room early. The room was gorgeous, lovely tiled floor, large comfy bed and great shower. My room opened directly onto the beautiful pool with lots of green plants. Amazing value for money, and they offer half price bottles of wine between 5-9! Love this place! I stayed at Pages Hotel twice during my trip in Cambodia. It was recommended by a friend who lives in Siem Reap and I loved it! 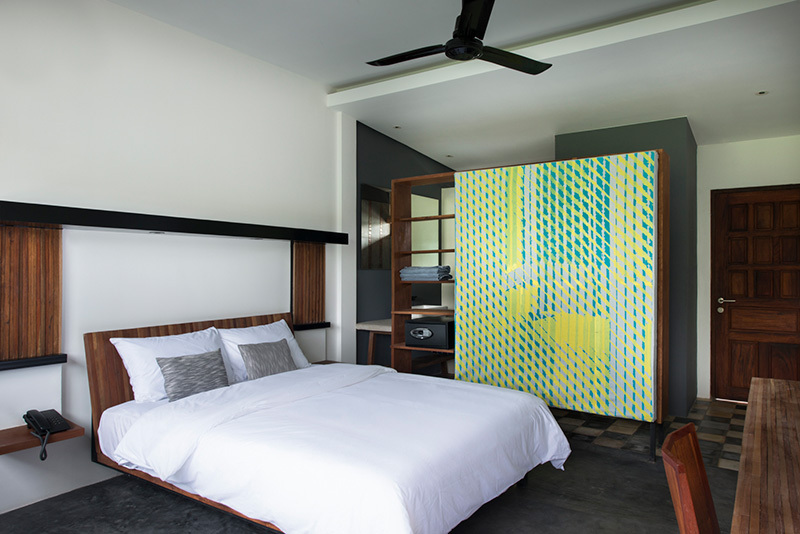 The rooms are big and open-planned designed with an industrial-chic air. The food at the cafe is delish (obsessed with their lime and mint cooler!) and the swimming pool area is beautiful, zen and perfect to chill! The staff is lovely and very attentive with guests. They’re also part of the “refill not landfill” program in Siem Reap trying to reduce and eradicate the use of plastic. Design is industrial and functional. Location in quiet area. Neighborhood is leafy area. Breakfast is generous. Room (triple) is spacious. Pool is tiny but functional. Cafe is great for talking with friends. Staffs were all helpful. Basically everything about this hotel is recommended. Would definitely come again. O quarto,equipe,estrutura e restaurante muito bom!superou minhas expectativas,fiquei muito triste em ir embora,o pessoal é muito amável e o hotel maravilhoso,muito aconchegante! Piękny industrialny styl zarówno w pokojach jak i w lobby, a jednocześnie kameralny obiekt. Orzeźwiający drink ma powitanie był milym zaskoczeniem. Bardzo sympatyczna i przyjazna obsługa. Blisko pub Street, żeby poczuć klimat nocnego życia w mieście. Wir haben 4 Nächte im pages rooms verbracht und haben uns sehr wohl gefühlt! Die ruhige Lage war perfekt für erholsame Stunden nach anstrengenden Ausflügen. Vom Hotel zur pubstreet läuft man ca. 10 Minuten. Speziell hervorheben möchte ich unseren Tuk-Tuk-Fahrer Borey Peth, welcher für das pages Fahrten duchführt. Er hat uns vom Flughafen abgeholt und uns auf all unseren Touren begleitet, beraten und umsorgt! Ein sehr angenehmer und freundlicher Mensch, der unseren Kambodscha Trip perfekt gemacht hat! Vielen Dank! 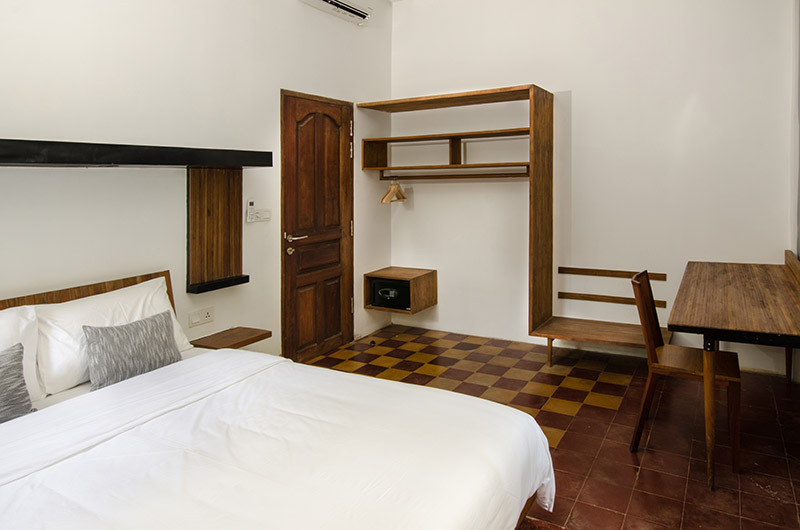 Our Superior Room has a comfortable queen size bed covered with luxurious linen, soft pillows, a stylish open shower, and an independent toilet. There’s a modern desk workspace fitted with a leather covered area and a desk lamp for when you want to focus on either work or play. Amenities include high-speed wireless internet, flat-screen cable TV, a mini fridge, and an electric kettle for your morning coffee and afternoon tea. 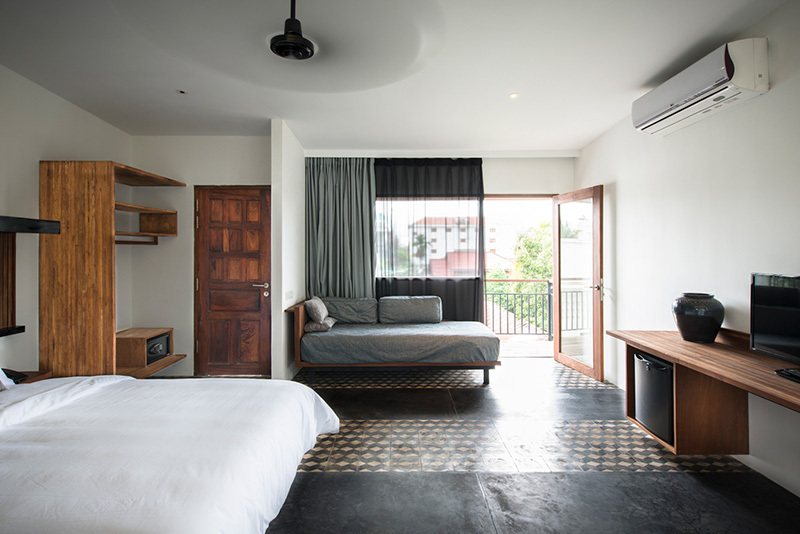 The floor is designed with unique and original Cambodian tiles that will make you feel at home. The highest level of comfort and space. 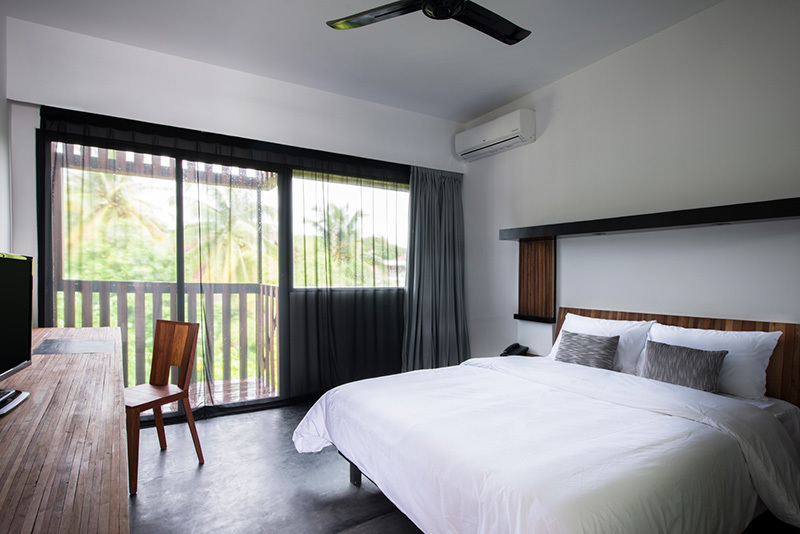 Our Deluxe Room has a comfortable queen size bed covered with luxurious linen, a stylish open shower, an independent toilet, and a sofa bed for when you want to just lounge and relax. To make you feel truly pampered, we’ve also chosen some special, natural, and locally made bathroom luxuries for you from Bodia Spa and local custom-designed bathrobes from Maison Sirivan. There’s a modern desk workspace fitted with a leather covered area and a desk lamp for when you want to focus on work or play. Amenities include high-speed wireless internet, flat-screen cable TV, a mini fridge, and an electric kettle for your morning coffee and afternoon tea. 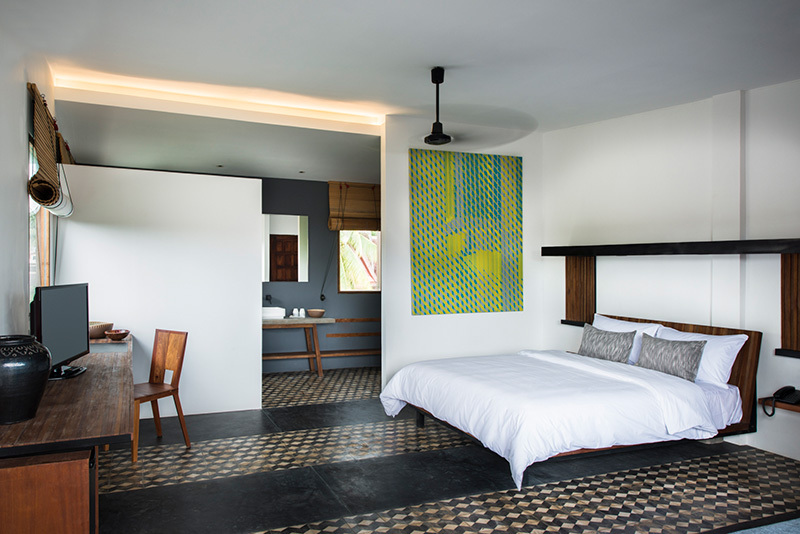 The room’s floor is designed with unique and original Cambodian tiles. Its large space will let you enjoy a dance, a moment of yoga or even a game with friends. 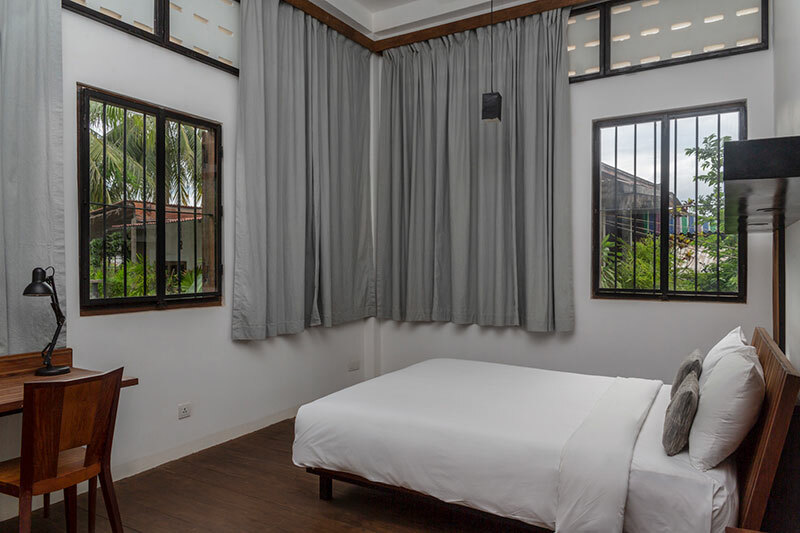 Complete with a perfectly situated balcony to give you first views of the beautiful Cambodian sunrise and the rising moon at night. The highest level of comfort, space and privacy. Set in a building created in the mid-60s, Apartment A has one separate bedroom with a comfortable queen size bed covered with luxurious linen, a big walk-in shower with drying area for maximum comfort, an independent toilet, a living room with a sofa bed for when you want to just lounge and relax, which could easily accommodate a child at bedtime, and a furnished kitchenette. 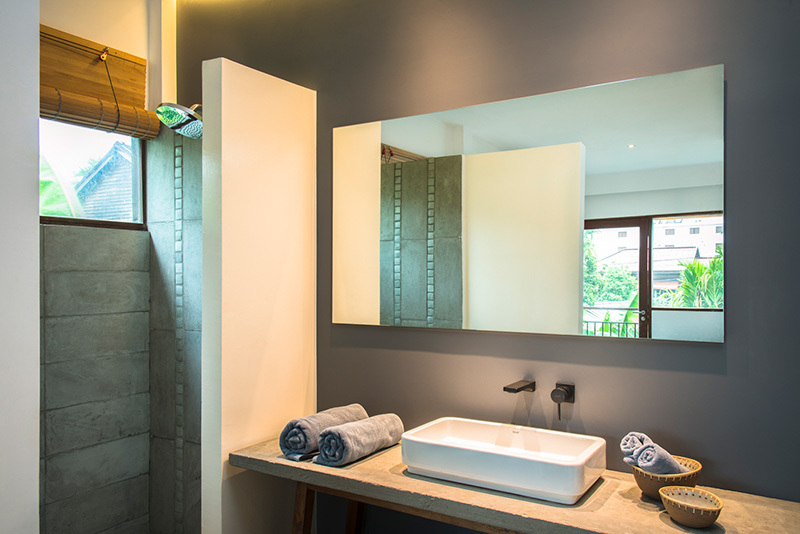 To make you feel truly pampered, we’ve also chosen some special, natural, and locally made bathroom luxuries for you from Bodia Spa and local custom-designed bathrobes from Maison Sirivan. The bedroom has a modern desk workspace and a desk lamp for when you want to focus on work or play. Amenities include high-speed wireless internet, flat-screen TV, a mini-fridge, induction hob, a microwave oven, pots and pans, cutlery, plate set and an electric kettle for your morning coffee and afternoon tea. 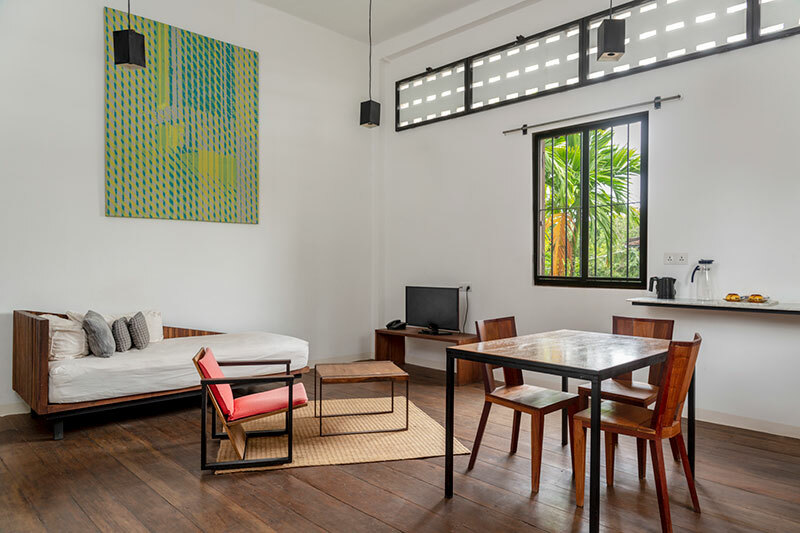 You will feel at home in this private apartment as it is designed with original Cambodian floor tiles, and its bigger space will let you enjoy family or group dinners around the kitchen table, a moment of yoga or even a game with friends and family. Set in a building created in the mid-60s, Apartment B has one separate bedroom with a comfortable queen size bed covered with luxurious linen, a big walk-in shower with drying area for maximum comfort, an independent toilet, a living room with a sofa bed for when you want to just lounge and relax, which could easily accommodate a child at bedtime, and a furnished kitchenette. The bedroom has a modern desk workspace and a desk lamp for when you want to focus on work or play. Amenities include high-speed wireless internet, flat-screen TV, a mini-fridge, an induction hob, a microwave oven, pots and pans, cutlery, plate set and an electric kettle for your morning coffee and afternoon tea. 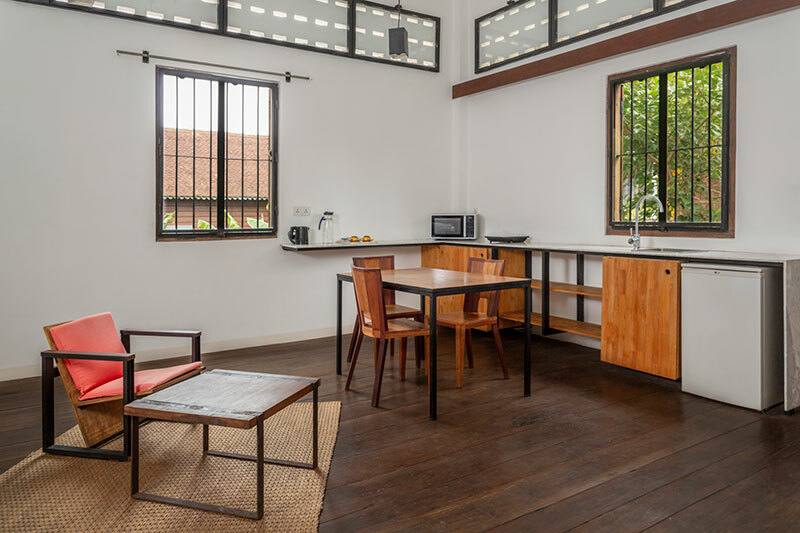 This apartment has preserved the building’s original wooden floor giving a warm homely feel. Its bigger space will let you enjoy family or group dinners with windows that let in plenty of natural light and unique views, adding to the relaxing feeling of being closer to nature.